In-depth portrait of two prominent women in the Islamic world. Two women, one from Somalia, one from Pakistan—both intelligent, ambitious and Islamic: So how did one woman become a strong opponent of Islam and its practices toward women and one woman become a supporting member of the mujahideen? This is the fundamental question Scroggins (Emma’s War: A True Story, 2002) attempts to answer in her comprehensive chronicle of the private and public lives of Ayaan Hirsi Ali and Aafia Siddiqui. The Somali-born Ali found refuge in Holland, where she rose to a leadership role in Dutch Parliament while waging war against the Islamic practices that hold women behind “the veil and the home’s four walls.” On the other hand, Siddiqui feverishly defends Islam and willingly works with members of al-Qaeda and the Taliban to promote the Koran in the hopes that “more and more people come to the [religion] of Allah until America becomes a Muslim land.” Secret marriages, lies, death threats and disappearances add “layers to the tale of the war on terror,” while disturbing descriptions of female genital mutilation, beheadings and torture add to the behind-the-scenes immediacy and significance of Scroggins’ extensive reporting. 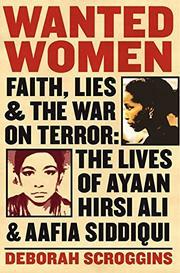 Although the alternating chapters disrupt the flow of each woman’s personal story, readers will question the role of women in Islam and the world as they learn more about the “anti-Muslim pundits and politicians in the United States and Holland” and the positions taken by the CIA, FBI and various Islamic groups during the War on Terror. A capable narrative of two women with similar backgrounds who moved in radically different directions because of their religious upbringing. Award-winning reporter Deborah Scroggins turns a critical eye on the intersection between women’s rights and modern Islam in her latest, Wanted Women. Read more new and notable nonfiction this January.